You need to get to Bocas del Toro NOW. Seriously. In a recent article written by Travel + Leisure magazine Bocas del Toro, Panama was named the #1 place to visit in 2016. The Isthmus of Panama is home to some of the purest natural beauty in Latin America: dense tropical rain forests, wide savannas, coral reefs bursting with aquatic life, and delightfully deserted beaches. The latest idyllic spot to emerge on travelers’ lists is Bocas del Toro, an archipelago made up of nine islands and hundreds of cays and islets. In the country’s northeastern corner—a one-hour flight from either Panama City or San José, Costa Rica—it’s a sanctuary where the main mode of transportation is a wooden motorboat, dolphins swim through crystalline waters, and dockside restaurants serve the local fishermen’s catch of the day. Bocas Town, the archipelago’s main village, is equal parts rickety and charming, with tin-roofed wooden houses converted into colorful boutiques, guesthouses, and restaurants—head to Ultimo Refugio for the best food in town. We have been saying it for a while, that Bocas del Toro still remains ‘off-the-beaten-path’, but for how long? If you want to see that authentic Bocas del Toro that still exists come now… this is the year of Bocas del Toro, Panama. Here is our top ten reasons why Bocas del Toro, Panama should be your 2016 getaway. Food and lodging in Bocas del Toro, Panama is still relatively much more affordable than neighboring Costa Rica. For example, in on the main island of Isla Colon you can stay in an oceanfront bed and breakfast, sleeping to the sound of waves for less than $100 a night with a gourmet breakfast included. Vacation real estate properties are half that of similar ones in Costa Rica. Bocas del Toro has several organizations that offer the opportunity to enjoy Bocas while making a difference. Surf For Life teams up with Give & Surf in Panama from Bill Stefanacci on Vimeo. Don’t miss out on the local Caribbean cuisine while in Bocas del Toro. Try the famous ‘rondon’ soup made with coconut milk, fish, roots, curry and lots of spice- an oceanside restaurant called the El Beso del Dragon makes a killer version of rondon with a whole fried red snapper inside. Look for the local boys on bikes selling ‘plantita’ a local empanada made of sweet plantains or spicy beef. The sweets here are awesome and super cheap. On South Avenue a little after the ferry dock check out a small store that sells best ‘bon-bons’ (a cinnamon roll) on the island and ask for their cocada, a sweet coconut ball that makes a delicious treat. The variety of restaurants here are explosive. Everything from Asian sushi to Caribbean fusion restaurants are available. Our favorites are Taco Surf, a super affordable Baja style restaurant offering fresh fish tacos and some of the best shakes on the island. Also try El Ultimo Refugio located over the water- the food is plentiful and delicious, the drinks are ice cold and there is live music just about every other night. La Casbah offers Mediterranean menu with killer steaks and our favorite salads. Try out a vegetarian restaurant called Leaf Eaters- after being open for a couple of years on Isla Colon, is now open on Isla Carenero offering over the water seating and some of the best vegan dishes that we have tried in Panama. Looking for a quick snack? Late night restaurants are also available- don’s miss out with Munchies, a local hamburger place with a happening bar located in an old Caribbean style building in the center of Bocas Town. Bocas del Toro has everything that Panama has to offer: mountains, cloud forests, mangrove-lined coasts, secluded white sand beaches, uninhabited islands, adventure, relaxation, a wealth of biodiversity, and a well-established travel industry. Try another island. Check out accommodations on Carenero and Bastimentos islands. You can find some of our favorites here or check out our #5 reason to visit in Bocas del Toro this 2016. Bocas Town, Isla Colon is the only “wooden town” in Panama that happens to be a capital of a province. It is constructed almost exclusively of lumber. The predominant architectural style is Caribbean colonial, a Victorian style that reminds many of the old Key West, Florida ambiance. The Bambuda team is very proud to show you our new Cabin Suite's. A labour of love has become a place where you can relax to the sound of laughing parrots and the natural hum of the rainforest. How about this jungle suite with a pool at The Fire Fly Bed & Breakfast on Isla Bastimentos? Lilah Yoga SUN FUN YOGA: Bocas Del Toro from pietro ciotti on Vimeo. Go ATVing with Flying Pirates, the jungle paths on Isla Colon will be the most exciting experience you have while in Bocas del Toro. Go snorkelling around the Bastimentos National Marine Park. Panama is more famous for it’s coffee, considered one of the best coffee in the world, however the local cacao is quickly making the world buzz as well, and it happens that Bocas del Toro is the center of it all. Bocas del Toro not only is the surfing mecca of Panama, but it also boasts the best hotels and surf tour businesses in the country. No other destination in Panama offers the quality of surf orientated services that Bocas does. Whether its learning how to surf, staying at the best surf resorts in the isthmus or renting the best gear Bocas has it all. 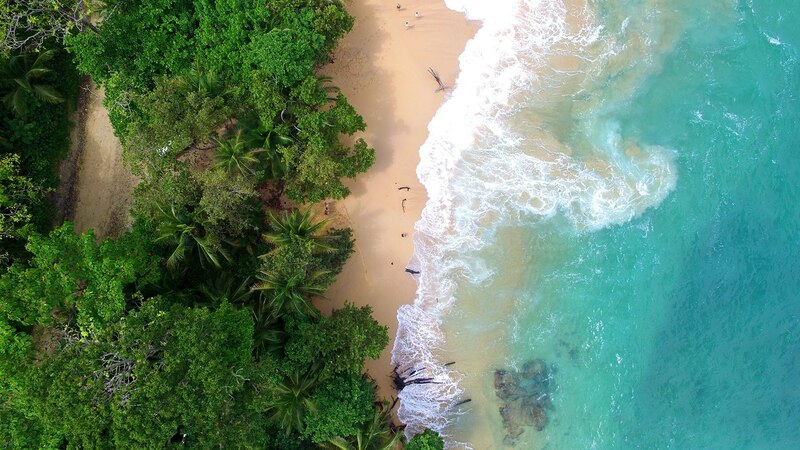 Home to a UNESCO World Heritage Site and Panama’s first National Marine Park, Bocas del Toro has also become one of Panama’s most visited eco-tourism destinations. Considered the ‘Galapagos of the Caribbean’ Bocas del Toro is also one of the most biologically diverse places on earth. Bocas del Toro is not necessarily a beach destination (but we do have pretty amazing beaches). Rather, the Bocas del Toro landscape is characterized by its many mangrove–ringed islands and clear coral reefs. This part of Panama was the first part of the isthmus to emerge from the ocean in the volcanic uplift. It is the oldest ecosystem of Panama and has had a long timespan in which to slowly and specifically evolve. It is a vast genetic bank. There is a particularity to the area with its combination of mangrove, volcanic mountain range, and coral reef ecologies. See more. There are also several businesses and tours offering eco-friendly ways to explore Bocas del Toro’s natural habitat. Check out Tranquilo’s Bay birdwatching tower, one of Bocas del Toro’s best places for birdwatching related activities and accommodations.